Based in Orange County California, Cosmic Fog Vapors popped on to the vaping scene back in 2013 and quickly earned high praise for their unique and flavorful e-juice blends. The #6 pick on our top craft e-juice list, they certainly impressed our team when we first tried them out, and they continue to innovate and expand their product line. You can find Cosmic Fog e-liquid almost everywhere, including reputable suppliers such as Direct Vapor, Huff & Puffers and Vapor DNA. The company proudly touts their experience in the “culinary world,” and even though the details are vague, it makes perfect sense that culinary experts would be akin to developing tasty, satisfying e-liquid flavors. According to their website, it takes an average of 7-10 months to develop each of their products. In addition, each flavor is tested by their team for weeks after development, ensuring that they’re blended to perfection and stand the test of time. Church (4/5) – A tasty dessert vape described as an “old fashioned vanilla ice cream” with hot fudge and sliced bananas, Church is complex and sweet with a creamy vanilla base and subtle hints of banana, followed by more creamy vanilla and a nice burst of chocolaty fudge on exhale. It’s sort of like a tootsie roll mixed with vanilla, with some of us picking up more banana notes than others. We definitely found it smooth and enjoyable, although describing it as a sundae may be a stretch. With that being said, if you’re into sweet and flavorful desserts, it’s one of the better options we’ve tried. Cola Gummy (2.5/5) – We haven’t had much luck with cola flavors, and Cola Gummy was a big disappointment like all the rest. It’s supposed to mimic the taste of those gummy cola candy bottles, but it was just way too sweet and chemical-y for our liking. We did get some cola flavor, and even a bit of fizziness, but it had a sharp chemical-like aftertaste and it was way too sweet and overpowering. Might be OK for some… but not for us. Euphoria (4/5) – Over the past year we’ve become big fans of cereal flavors, and plenty of companies are now offering cereal-flavored juice blends. Comic Fog’s Euphoria falls into the Fruity Pebble category, a fruity blend of citrus, berries and milk. We felt like it was right up there with some of the best, offering a nice balance of flavors, without being overpowered by citrus-y lemon like some offerings. We’ve heard about this problem occurring if you don’t let it steep, but we let it sit for 2 weeks and didn’t have an issue. With that being said, it was a little bit lighter on the creamy milk side – but it’s still an outstanding flavor that we’d certainly recommend. Krytonite (4.5/5) – Most of us had tried Kryptonite before, and we loved it just as much this time around! Of course we’re all big fans of fruit flavors, and Kryptonite just so happens to be one of the best. Described as “cool melon paired with your favorite candy,” the first thing that comes to mind is Watermelon Bubbalicious gum. It has a refreshingly sweet melon candy flavor that finishes off smooth, with what almost tastes like cucumber or possibly a bit of mint. It’s definitely not a menthol flavor, but if it’s mixed in it’s barely noticeable. Either way, Kryptonite is one of our favorites. Milk & Honey (5/5) – Kryptonite was certainly “one of our favorites,” and there are other flavors we enjoyed too, but Milk & Honey is by far the best! It’s definitely the most popular Cosmic Fog e-juice flavor, and there’s a reason so many people rave about it. It’s creamy, smooth and subtly sweet making it a perfect all-day-vape. Just as the name implies, it starts off with a smooth, milky inhale and follows with a subte sweet honey’nut aftertaste. People often compare it to the leftover milk in a bowl of Honey’Nut Cheerios, and that description serves it extremely well. It’s one of those flavors that you never get sick of and always seems to hit the spot. We all love it, and we’ve purchased it multiple times… you should probably try it too! Nutz (4.5/5) – Nutz provides a unique spin to your typical strawberry cream e-liquid by adding a nice chunk of nutty almond and subtle hints honey. 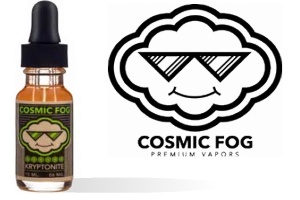 Cosmic Fog describes it as strawberry preserves spread over almond butter, topped with whipped honey creme. That’s a pretty accurate description, since it’s definitely not a ripe strawberry flavor, and you get creamy, nutty almond notes throughout. The honey was barely noticeable and the sweetness seemed to vary, depending on the device. Either way it was a delicious, well-balanced flavor that scored well with our team. The Shocker (3.5/5) – Although we’re normally not fans of e-liquid with “lemonade” in the description, The Shocker was nicely balanced with strawberry and other fruits. Make no mistake, it definitely had citrus-y kick that overpowered the strawberry, apple and mango, but the other fruits softened it up a bit and made it more interesting. As with any citrus flavor it had nice little throat kick, even at 3mg. Some of us picked up more strawberry than others, and it wouldn’t be an all-day-vape for any of us, but we all thought it was refreshing and enjoyable – in moderation. 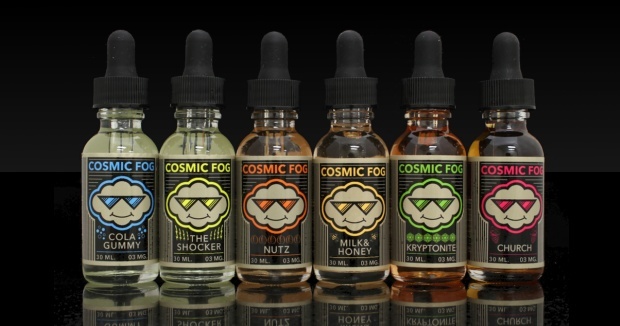 Considering this was our third and forth go around on some of these flavors, it’s safe to say that we’re really big fans of Cosmic Fog e-juice. Milk & Honey and Kryptonite are the two flavors that we regularly recommend, and after this review we took a liking to Nutz and Euphoria as well. The only flavor that completely turned us off was Cola Gummy, but soda flavors have never been our thing and personal preferences always come in to play during our e-liquid reviews. Is Cosmic Fog e-liquid a bit pricey? YES. But considering the quality and uniqueness of their selections, we’ll pay a little extra any day. ABOUT OUR REVIEWS: Since flavor preferences vary and depend on various factors, we use multiple members of our team to complete our e-juice reviews. This Cosmic Fog review was conducted by: Jeremy Salter, Vanessa Salias and Christopher Arthur. Their feedback was gathered, combined and summarized on this page, but please keep in mind that this is the general opinion of our team and should be treated as such. Liquid performance varies depending on the device, and flavor preferences vary for each individual. We strongly suggest that you consider the feedback of others and experiment on your own. This is our Cosmic Fog e-juice rating. How would you rate Cosmic Fog? What do you think about the company and their products? Please share!